For yet a third time, a federal judge has ordered the NYPD to release 2,000 pages of secret documents, showing how it spied on groups planning legal protests at the 2004 Republican National Convention (RNC) at Madison Square Garden. 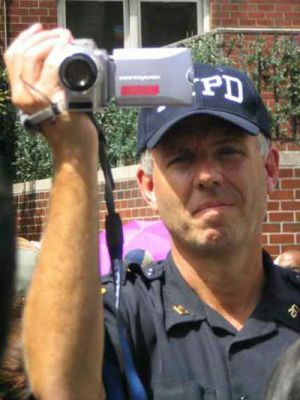 On Dec. 14, District Judge Richard Sullivan affirmed a 2008 order by Federal Magistrate James Francis, IV that the NYPD’s Intelligence Division turn over the documents. But will Police Commissioner Ray Kelly and his newly appointed $165,000 special counsel, Katherine Ann Lemire, formerly of the U.S. Attorney’s office, find another legal dodge to avoid doing so? In short, will Kelly and Deputy Commissioner for Intelligence David Cohen abandon their “secret documents defense,” and therefore lose their case against the protesters so that New Yorkers will never see those secret files? In court papers known as the “Cohen Declaration,” Cohen had argued that releasing even redacted secret documents would compromise the department and harm the fight against terrorism. A more cynical interpretation would be that releasing the documents would embarrass him and Kelly, revealing that the Intelligence Division’s spying might not only have been inept and misguided, but illegal. In an apparent last minute decision on the eve of discovery on Dec. 12, 2006, after two years of litigation, the police department had cited this spying to justify the arrests of 1,806 protesters at the RNC. That decision, by police department and city lawyers, led to the revelation of the Intelligence Division’s secret spying. Until then, no one outside the NYPD knew of it. The New York Civil Liberties Union (NYCLU) had questioned whether many of those protesters had been illegally detained. The department maintained that the protesters’ arrests and detentions stemmed from what Intelligence Division detectives had learned from their spying. But when the NYCLU asked exactly what Intel had learned, and sought to see the documents, Kelly and Cohen refused to reveal them. The spying became public knowledge in March 2007, when Jim Dwyer of The New York Times revealed that Intel detectives travelled to cities across this country, and to Canada and Europe to secretly monitor people who planned to protest at the RNC. “In hundreds of reports stamped ‘N.Y.P.D. Secret,’ the Intelligence Division chronicled the views and plans of people who had no apparent intention of breaking the law, the records show,” the Times reported. Now let’s step back and examine how all this might have come about. This apparent abuse of power began with Commissioner Kelly’s response to the horror of the 9/11 attacks, when he expanded the department’s long dormant Intelligence Division under Cohen, a 35-year veteran of the CIA. In February 2003, after police arrested 274 people who demonstrated against the Iraq war, Intelligence Division detectives questioned the protestors in their cells, demanding to know the names of their friends and political affiliations, what schools they had attended, what organizations they belonged to, what they thought of Israel and Palestine, and where they had been on 9/11. Federal Judge Charles Haight reprimanded Kelly, who promised that such questioning would end. In the fall of 2003, Kelly and Cohen began sending Intel detectives on secret forays out-of-state, where the NYPD lacks jurisdiction, without informing the FBI or local authorities. On the Jersey shore, Intel detectives conducted a sting of scuba shops before local authorities asked them to leave New Jersey. In the town of Carlisle, in western Pennsylvania, they investigated the theft of explosives before the local police chief asked them to return to New York. In Boston, Intel detectives infiltrated a church meeting of a protest group called the Black Tea Society, and then were nearly arrested for speeding after initially refusing to identify themselves to Massachusetts state police. Meanwhile, Kelly and Cohen based Intelligence Division detectives overseas to rival the FBI. Perhaps their most notable achievement was succeeding in being faster than the Bureau to interview the Spanish National Police after the 2004 Madrid train bombing. At Cohen’s direction in the fall of 2007, Intel detectives delayed the Iranian delegation to the United Nations at Kennedy airport for 40 minutes by searching them for weapons — violating diplomatic protocol, and disregarding protests from officials of the State Department, Secret Service and the Port Authority police. Last September, the Intelligence Division disrupted an FBI investigation into perhaps the most serious terrorism threat to New Yorkers since 9/11. Apparently without informing the Bureau, which had been tracking terrorism suspect Najibullah Zazi, Intel detectives showed his photo to one of their informants, a Queens imam, who tipped off Zazi. The Bureau was forced to arrest Zazi and the imam before learning the extent of the plot. Back in 2008, the Times also reported that the city had spent $8.2 million in settlement costs and legal fees growing out of Intel’s RN C spying. Whether or not the police department releases the secret spying documents or settles with the protesters, that cost is going to grow. Leonard Levitt wrote the column One Police Plaza for Newsday about the New York City Police Department from 1995 to 2005. He is the author of NYPD Confidential: Power and Corruption in the Country’s Greatest Police Force (Thomas Dunne Books, 2009). This article originally appeared at nypdconfidential.com.